No home is perfect—but with these simple, everyday habits, yours can come pretty darn close. The secret to a clutter-free home isn’t hours-long cleaning fests. Instead of devoting whole weekends to decluttering accumulated messes, try sticking to these daily clutter-clearing habits. They’re small changes, but they can derail any clutter build-ups and all but guarantee that everything can be found easily, even on rushed mornings. Once the whole household is on board, too, there will be much less daily clutter to deal with. And once these daily, pint-sized pick-ups become habit, it won’t even be a conscious effort. Before you know it, your house will look neater and fresher every day—no cleaning rag, sweeping, or designated clean-up time required. Before picking up these habits, make sure every item in the house has its own home: a place where it belongs that is out of the way and permanent (a specific spot on a shelf, for example). Tucking anything and everything into their respective homes at the end of the day promises a less cluttered morning. Start with these daily clutter-busting habits and be amazed at what a few seconds of daily effort can do. A jumbled pile of shoes at the front door (or main entry point to the home, wherever that is) sends a chaotic message to visitors and residents alike. Try to keep only one pair of frequently worn shoes per person by the door; keep the rest in a nearby bin or in individual closets. Encourage everyone to put shoes away immediately after getting home; digging out the pair of the day the next morning will be less of a hassle. It’s time to bid farewell to the chair—that drop zone near the bedroom closet that holds cast-off clothes, not-quite-dirty but not-quite-clean jeans, and pieces ready for the ironing board. 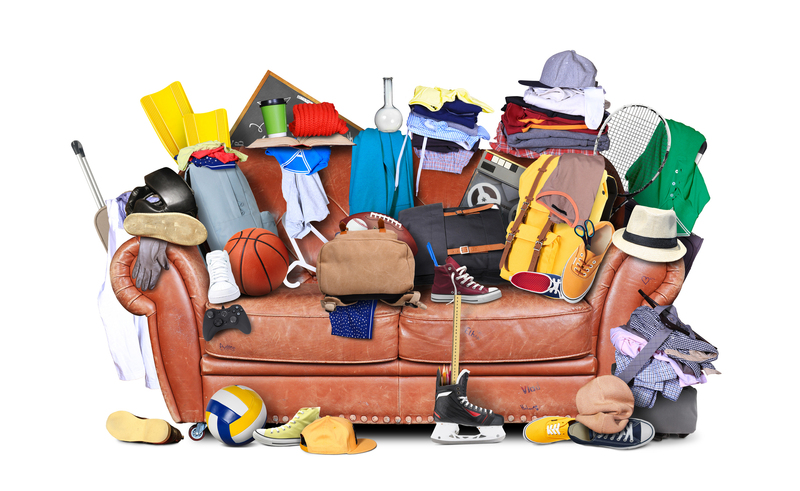 Even if it means moving the chair to a different room until the habit is formed, start putting articles of clothing away or in the hamper as soon as they come off or out of the laundry. Finding certain shirts or occasion-appropriate dresses will be a breeze, and the bedroom will have one less cluttered corner. If the living room is where everyone gathers at the end of the day, take a minute—literally—at the end of the evening to clear up the accoutrements of a relaxing evening in. Stick TV remotes next to the TV or in a designated box or bin, put books and magazines on shelves or in baskets, and fold throw blankets neatly. Before closing up the kitchen for the night, so to speak, put away any dishes and clear any papers, notebooks, books, etc. off surfaces. Breakfast and lunch-packing the next morning will go more smoothly without having to maneuver around these items, and walking into a decluttered kitchen first thing in the morning will feel just as good (almost) as a cup of coffee. Take 45 seconds—really, that’s all it takes—in the morning to make the bed. It gives the whole bedroom a pulled-together feel, no matter its clutter status, and makes climbing into bed at the end of the day feel so much more satisfying. Plus, if the central furnishing of the room looks put together, you’ll feel encouraged to help the rest of the room match it.